We’re all up to our necks in it: deadlines, bills, school supplies, car repairs, health concerns, the neighbor’s noisy music, that stinky something in the refrigerator that’s gone bad and can’t be located. And when we’re personally standing firm and holding fast, others around us are drowning. Look to your right and left at the next stoplight. See that guy? The weary one? See the angry mom? The weepy kid? That’s the human condition, right there. A philosopher might say it better than I can: “Everything is meaningless, utterly meaningless! What do people get for all their hard work? Generations come and generations go, but nothing really changes.” All our lonesome days under the sun, we strive, we struggle, we gain and lose again. What’s it all about? 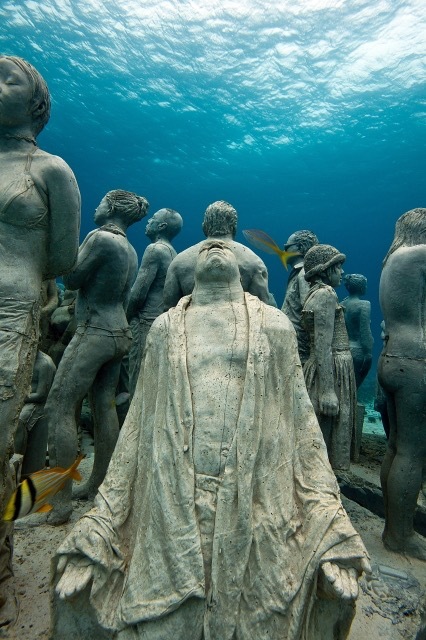 I wasn’t familiar with Jason deCaires Taylor until last week, as I searched the internet for images of slavery. 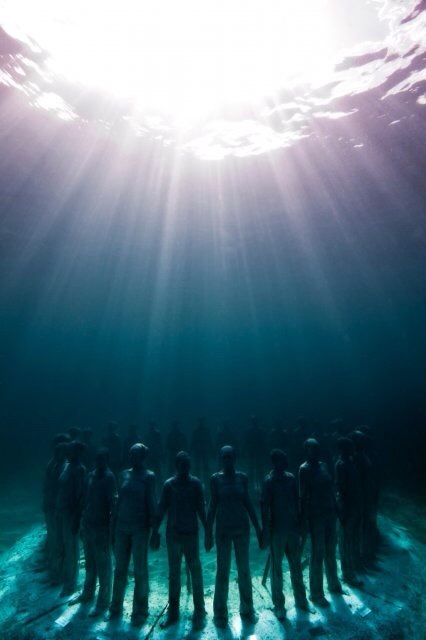 The first sculpture I found, a ring of people holding hands, popped up on a number of sites and was described as a memorial to the slaves lost during the brutal Middle Passage. (I have learned now that Taylor actually didn’t set out to create a memorial, but welcomed this interpretation.) That image, and all the varying photos of it, haunted me. Who built such beauty? 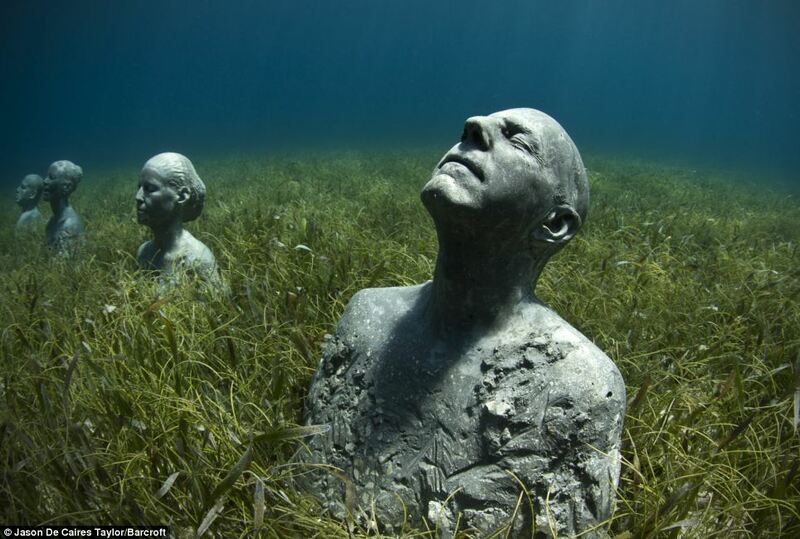 Who thought to leave it hidden under ocean? Won’t it be destroyed by salt and water? What else is tucked away out of view under the green waves? I’ve been snorkeling in the Florida Keys just once, and never scuba diving. I’ve put my face down out of the bright air and under the blue surface and discovered an entirely new world. It boggles the mind that such beauty exists in our midst, under our noses (or under the hulls of our paddle boats, more like) unseen and unvisited by all but a few. And I have only broken the surface, never dived down to the depths. 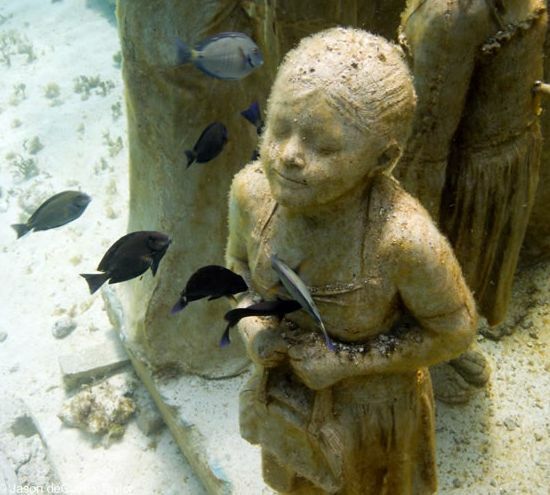 Of course, there are shipwrecks, fascinating museums to loss and adventure. 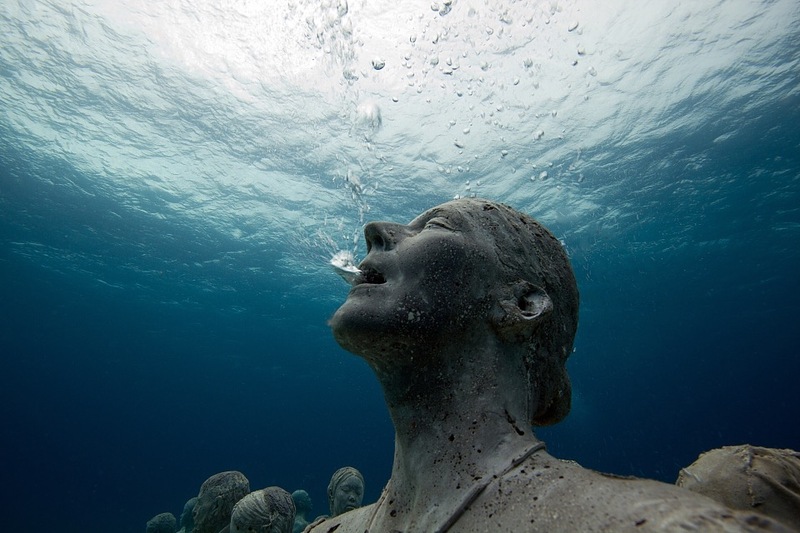 And in several scattered places in the world there are underwater sculpture gardens, or lone statues, like “Christ of the Abyss” in the Mediterranean. But Taylor really takes the cake. This man (born in 1974, same year as me! has he learned the secret of freezing time? how else can he have accomplished so much??) 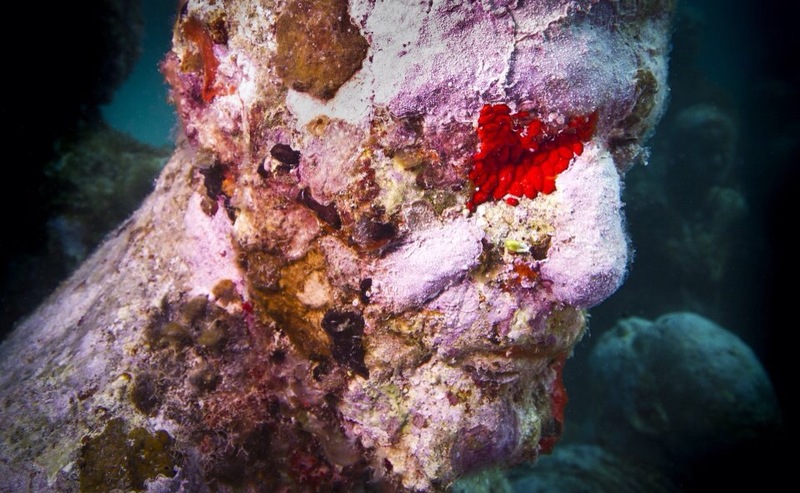 married his love of diving with his love of sculpture, and the result is dozens of incredible works of art making habitats for coral, starfish, shark. 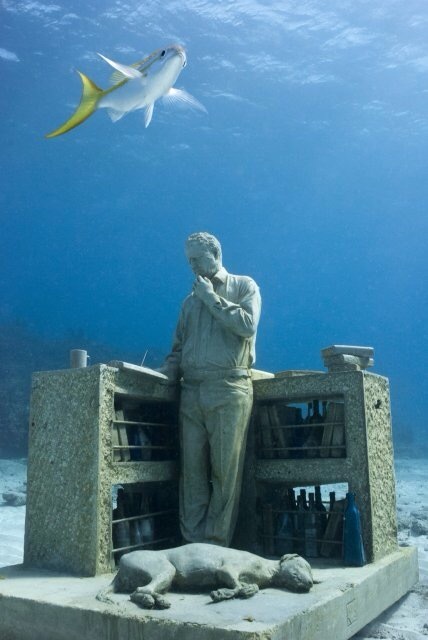 If his sculptures could think, if they took stock of the world, what would they find? Look to your right, look to your left — sorrow and weariness and trouble and decay. How quickly we age! How alone, unseen, forgotten, we are. Where is our creator, who set us here and left? And so, despair. Look down, brood. Stick your head in the sand. Return to dust. Oh, it’s all vanity. And let’s face it, if Taylor’s ranks of men and women were all alone under the sea, if never visited by angelfish or mermaid, then all his work would fade to oblivion for no greater good than the fact that they existed in the first place. Like Solomon’s parks and gardens, they would disappear under the silt of time, unmourned. But some of Taylor’s creations seem to sense another story. 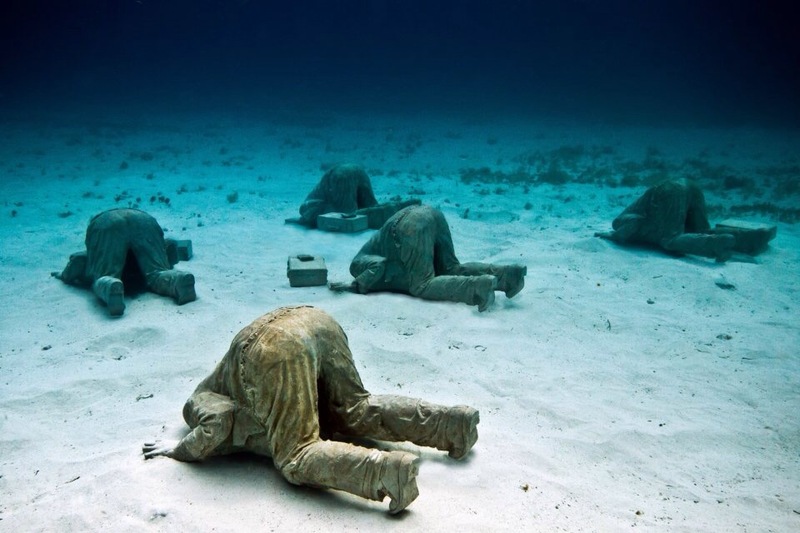 Instead of gazing down into the muck, they are looking up. The existence of an entire world above them must sound far-fetched to the underwater dweller. Farms? Airplanes? Roller coasters? Impossible, surely. But then, what is that light that pierces the water day after day? Who are these visitors who come and go? 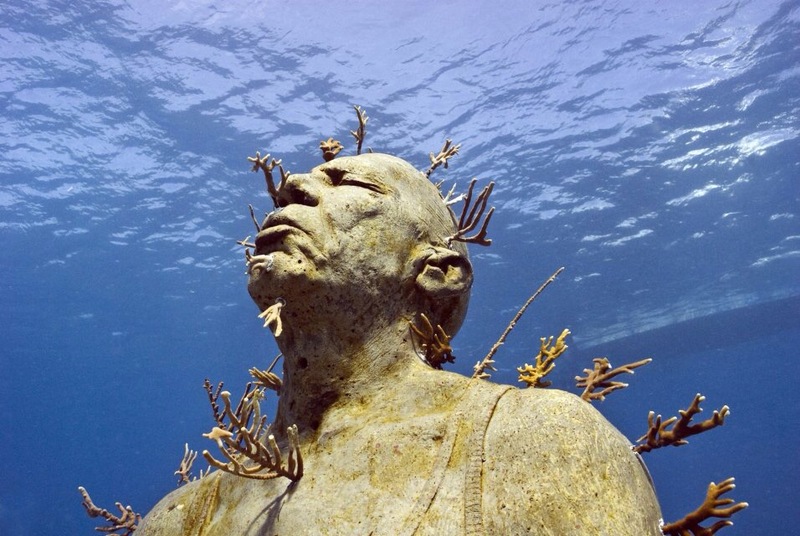 Under the water, under the sun, everything is futility. But if indeed there is another reality, another truth, an entire bright world where a person can breathe free, well, that puts another spin on it, don’t you think?